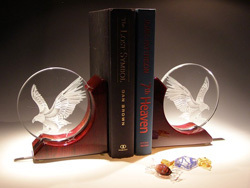 Both handsome and elegant, these rosewood bookends are adorned with discs of crystal that are etched with your selection from a wide variety of designs--or you can provide your own images or text to be etched. "Presidential Eagle" is shown here. 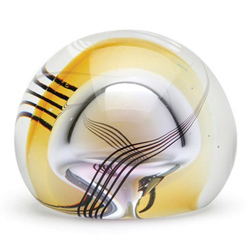 A wide variety of designs are available for these beautiful paperweights. The "Symphony" is shown here. Most are available in 3.5-4" sizes, and some also in a 2" diameter. Many of the designs have the added feature of "glowing" in the dark. LED light bases are available at an additional cost. $35.00 + up for large size. $12.00-$15.00 for the small size. 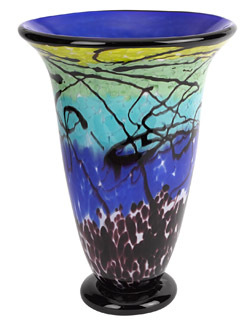 This truly gorgeous vase arches up to a 14" height with its swirls in shades of blue and splashes of black. It is fabulous a display piece and yet still functioinal as a vase. 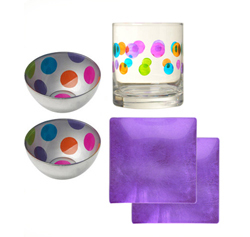 It's like sending a party in a box, when you give any of these fun, festive glass bowls, plates, glasses and/or trays. Bowls are 4" diameter and available in multiple variations of colors, gold & silver. 5" square plates come in metallic hot pink, turquoise, lime green, purple, gold & silver. Both the bowls & plates are sold in sets of two. Matching solid color trays (not shown) measure 13.5"x6.5". 10-oz. highball glasses are sold individually. 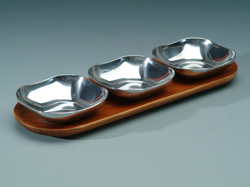 Bowls are crafted of an aluminum alloy. Oven, stove, grill, and freezer safe. Tray measures 13" long.